French onion soup is my all time favorite. I love the caramelized onion flavor, the toasted baguette croutons, and the gooey gruyere cheese on top. The beef broth is sweetly flavored with fresh thyme. This soup is really tasty, looks elegant, and the base can can be made in advance, making it really easy to prepare for company. Why haven't I made this before (she says, smacking herself in the forehead)? Thank goodness for Secret Recipe Club led by Sarah of Fantastical Sharing of Recipes, who works really hard to keep things going. It's a group of bloggers who are assigned another member's blog from which to choose a recipe to make once a month. We all reveal whom we had on the same day and at the same time. This was the impetus I needed to make my all time favorite soup. My assigned blogger is Susan of Food, Baby, Life. She is raising three boys, all under 5 years old, and lives in Australia. She's actually been blogging for almost six years! Now that she is a mom, she likes to cook healthy, but I'll forgive her for that (just kidding Susan!). She also has been an avid Tuesdays with Dorie baker. Just check out her Recipe Index. 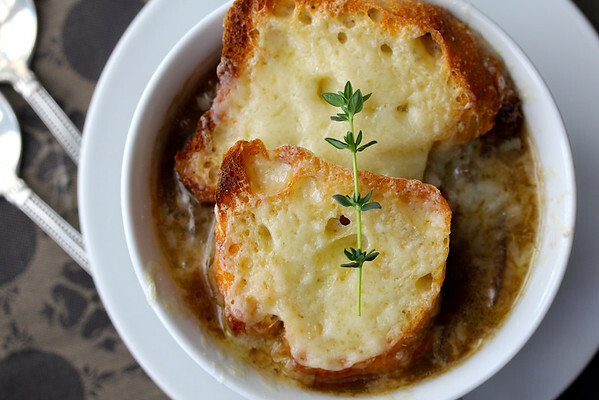 I immediately chose Susan's French Onion Soup, and I'm so glad I did. Delicious! Serves 6 to 8 as a starter, and 4 to 6 as a main course. Melt the butter in a large (6 to 8 quart) saucepan or saute pan over medium heat. Add the flour, and cook, stirring constantly, until the flour is cooked through, about a minute or two. Add the wine, and cook for another minute or two. Add the broth and bouquet garni and bring the pot to a boil. Reduce to a simmer, and cook, uncovered, for 30 minutes, stirring occasionally. Remove the bouquet garni and season with salt and pepper, to taste. Toast the baguette slices in a toaster, toaster oven, or under the broiler. If using the broiler, toast both sides. Place an oven rack about 6 to 8 inches below the broiler and turn it on. 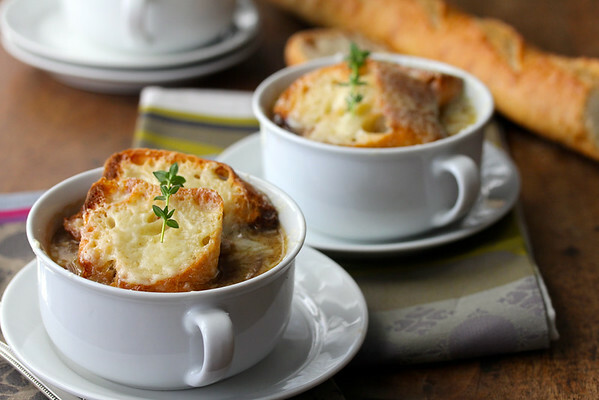 Fill broiler safe soup bowls or ramekins with the soup and top with two slices of the toasted baguette. Place a good handful of cheese in each bowl over the toast and soup. Place the bowls on a baking sheet, and broil for about a minute or two, until the cheese is melted and bubbly. If you don't have broiler safe bowls, you can sprinkle the toasts with the cheese, broil it, and place it on top of the soup. What a gorgeous photo, Karen. 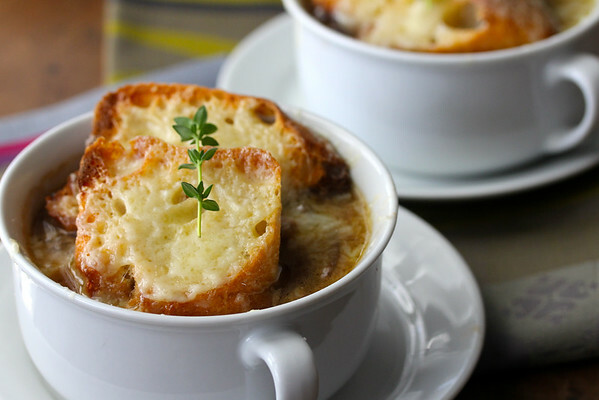 I love a good French Onion Soup too, and want to try this one. AND your beautiful baguette. Great pick this month! Thanks Susan! I loved this recipe. So nice to justify buying them =) ha ha. Thanks so much Susan for a fabulous recipe! Thank you so much Kelly! This is one of my favorite soups in the winter. So warming and comforting! And your bread looks to die for on top. Happy Reveal Day!! Thanks Emily! I'm so glad I finally tried making it! I am so glad I tried making it Rebekah! It had been way too long too! I love French Onion Soup! Great pick this month. I absolutely love and adore French onion soup with all my heart. I would have chosen this one, too! Such beautiful photos! Love french onion soup. Great pick this month. French onion soup is my FAVORITE!! Yours is gorgeous and those big croutons on top look to die for!! Yum!! French onions soup is so great with wine, isn't it? Love your photos. Excellent SRC selection. wow those are some delicious looking photos....my mouth is watering!! Oh, I had Susan's blog a couple of months ago. She has some great recipes, and this was an excellent choice. Funnily enough, even though I'm not a huge onion fan, I love French onion soup - partner not so fussed though, so it's a treat I enjoy when I'm on my own. So perfect for brisk days. Sending very Happy Thanksgiving wishes! That looks delicious, Karen. I'm also a big fan of french onion soup. Hi Karen, thanks so much for stopping by my humble little space earlier. You love your blog especially all those bread making. Its my favourite thing to do. And you Gruyere pain de campagne bread looks amazing ! love it so much. Happy Thanksgiving to you & your family.Enjoy & have a blessed day. 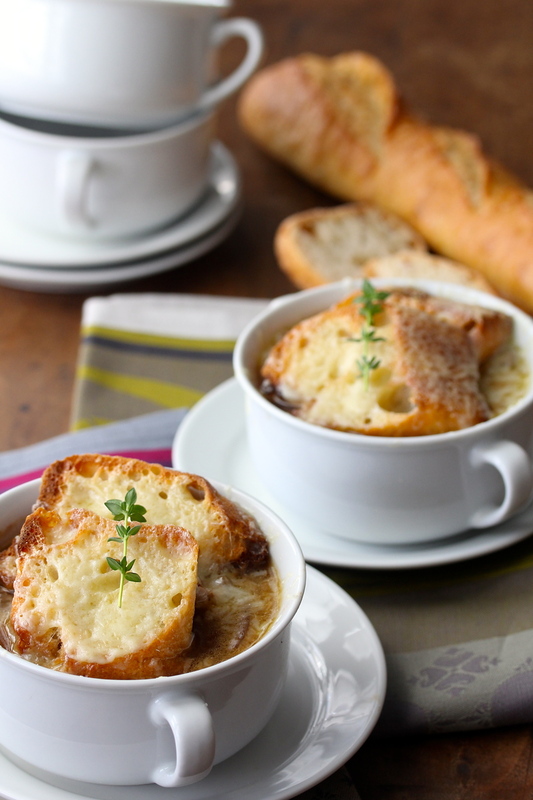 We love French onion soup and this one looks lovely! Hope you had a nice Thanksgiving! This soup looks ridiculously good! Even right now in the middle of summer! Thanks Whitney! Thanks for stopping by!